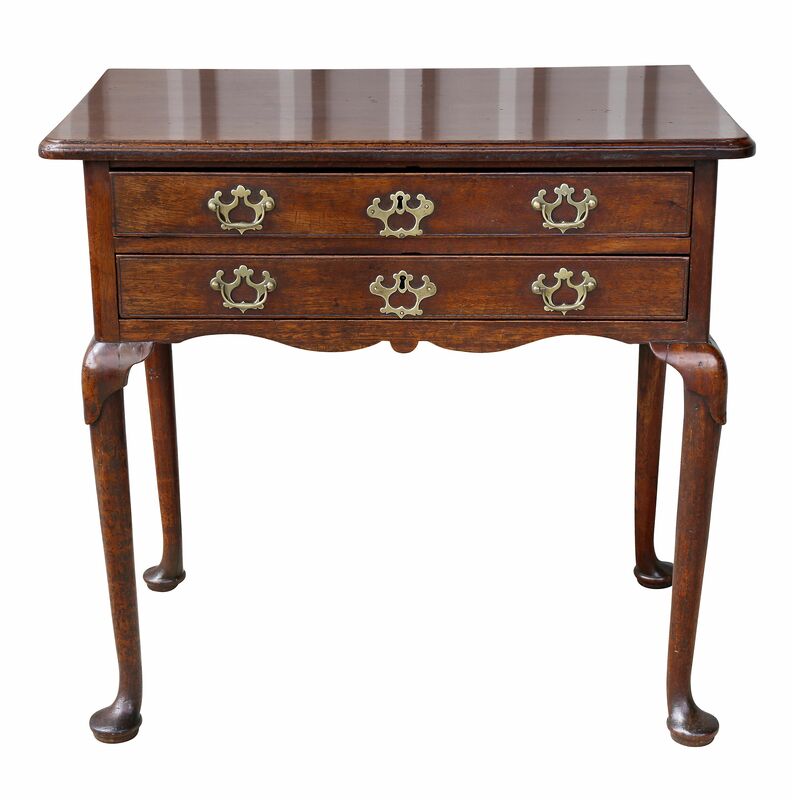 Christopher Storb has written an interesting post on a walnut bureau made in Philadelphia by the English joiner, John Head, who emigrated to British America in 1717. In the account book of the joiner John Head (1688-1754) there are debit entries for 45 desks, the first entry coming in 1719, two years after Head immigrated from England to Philadelphia, the last in 1742, two years before he ended his production of furniture. 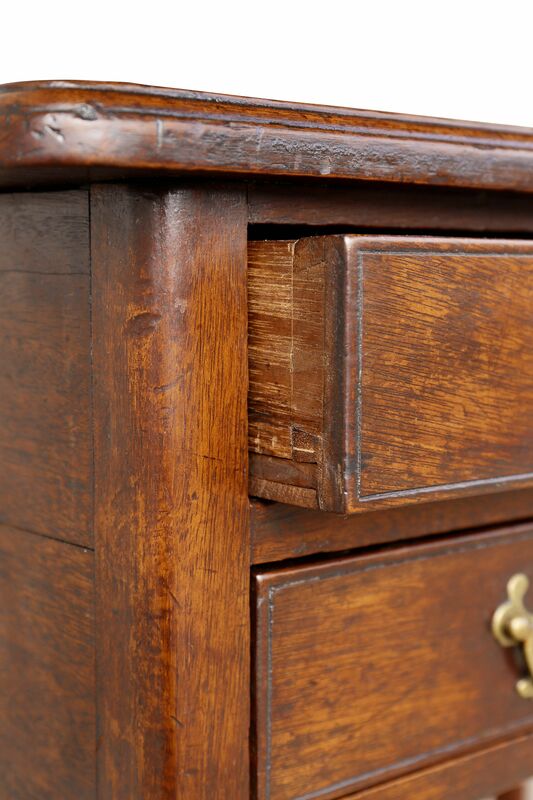 Compared to chests of drawers, there are few extant desks made before 1740 that can be attributed to the Delaware River Valley. 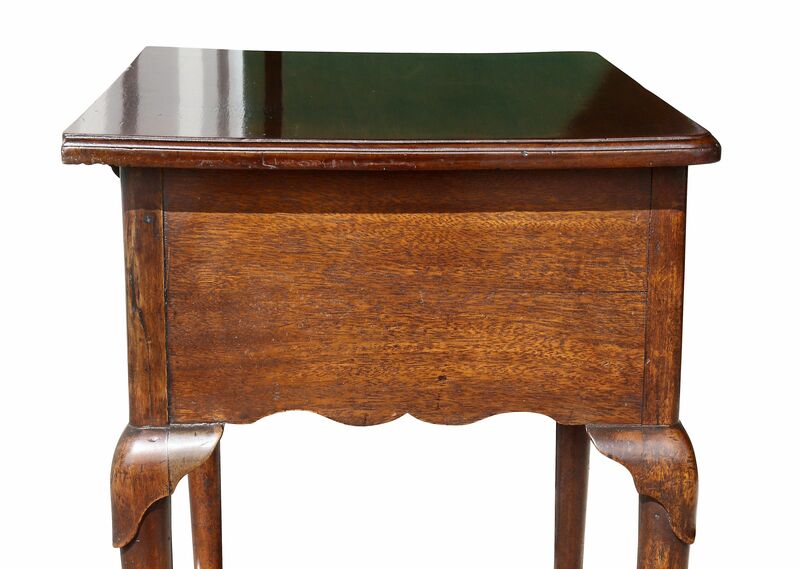 To date, only one desk, in a private collection, has been attributed to the shop of John Head. In the late 1980s I restored four elegant mid-eighteenth-century Irish ‘red’ walnut side chairs with stuffover seats. If I did take any photos of them, I can’t locate them now; however, I did take the time to make patterns of the chairs out of some heavy card. 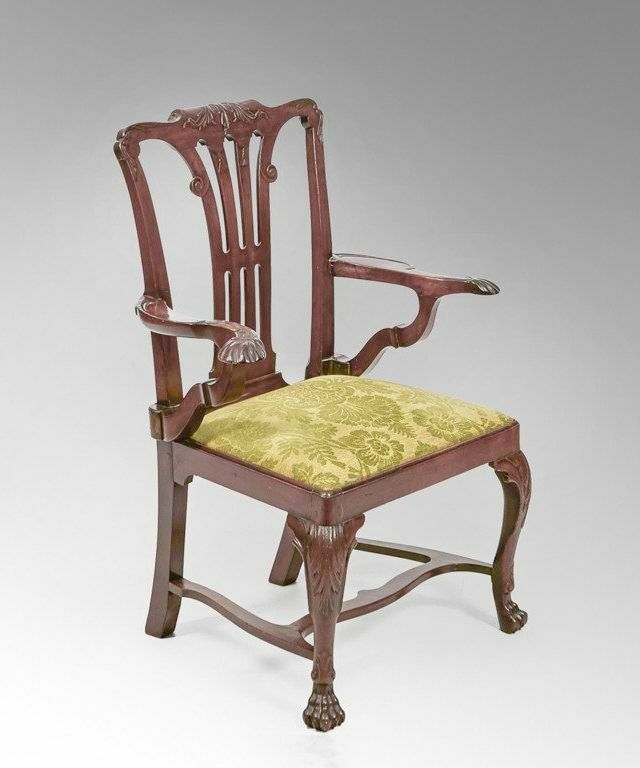 The chairs are fairly familiar; their elements are found in numerous Irish mahogany and walnut chairs of the period. 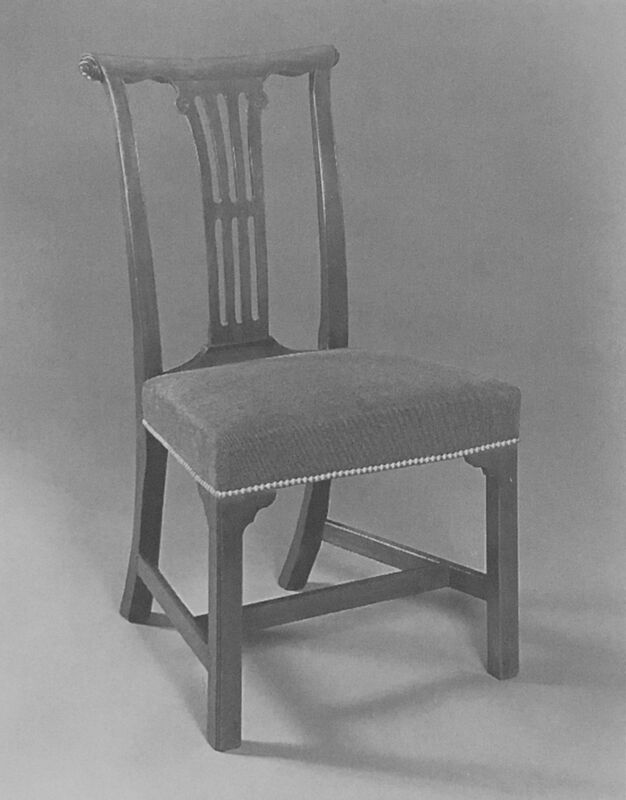 The simple undercarriages are typical of many Irish and English side- and dining chairs viz. 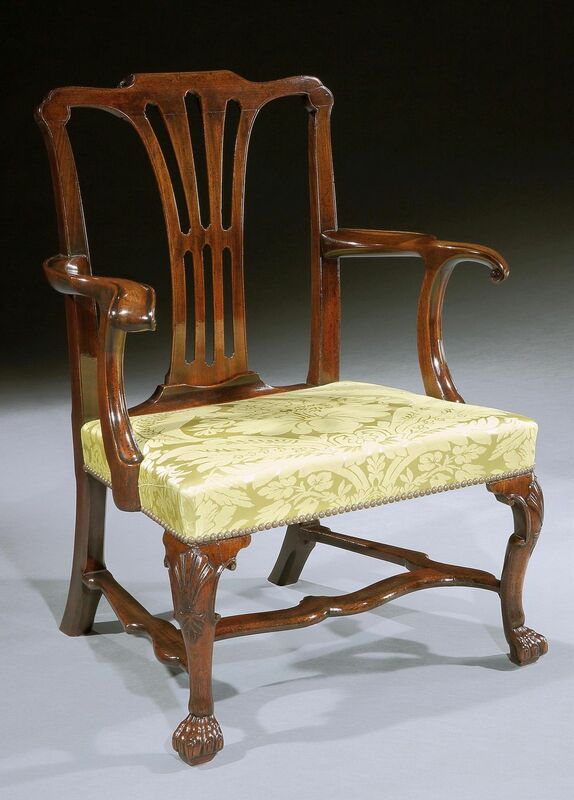 square, chamfered legs with H-stretchers, though Irish chairs often lack a rear stretcher (figs. 1,2,6,7 & 8) and more often than not, have the iconic shaped brackets at the juncture of the front legs and seat rails (figures 1, 2 & 3). 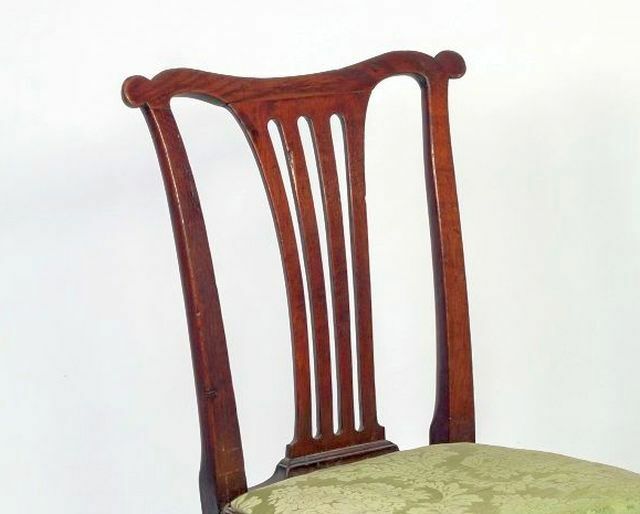 Though these chairs are frequently of fairly plain design, their crest rail ends are often subtly scrolled (figures 1 & 4) or eared – either incorporated or disjointed (figures 5, 6, 7 & 8). Fig. 5. 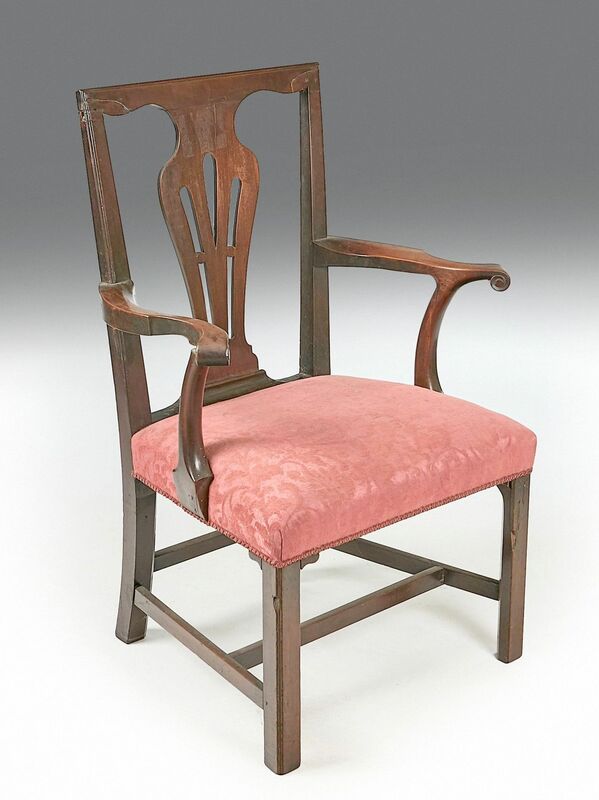 George II Irish mahogany side chair, circa 1755. 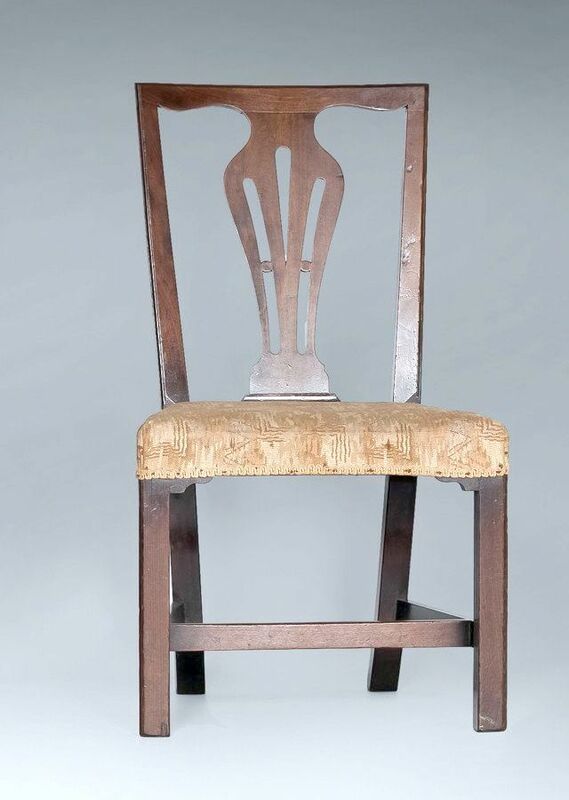 The undercarriages of the chairs I will be making are virtually the same as that in figure 1, whilst the rear stiles, splats and crest rails bear close similarities to the pair of elbow chairs in figures 6 and 7. GLIN, The Knight of, and PEILL, J. (2007) Irish Furniture. Yale University Press, p.209, fig. 17. 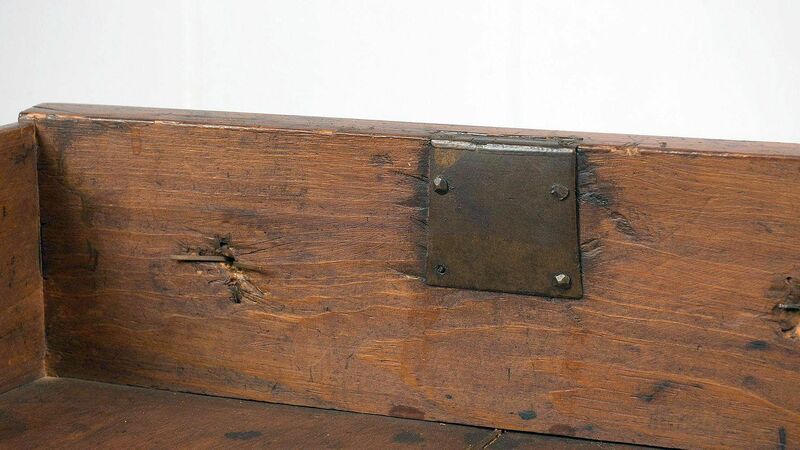 This is yet another example of case furniture from The Age of Walnut that employs largely unfashionable or anomalous domestic timbers in its construction. 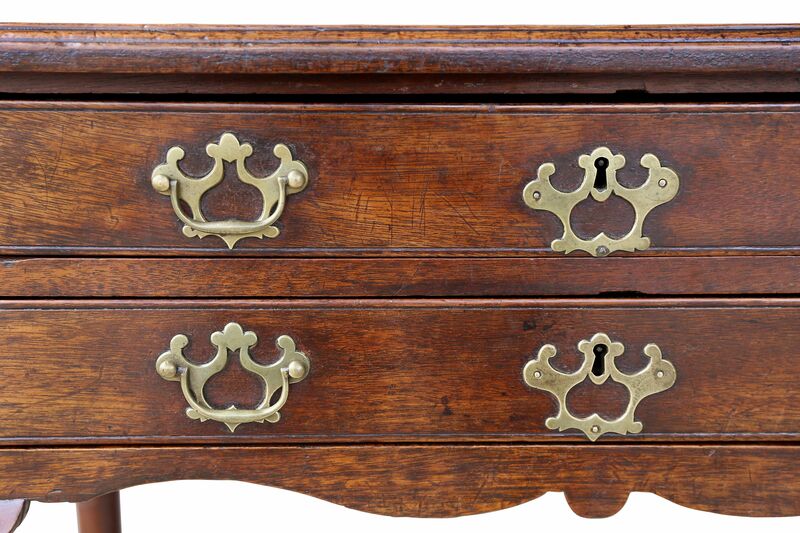 Unlike the sophisticated George II elm cabinet-on-chest in Picture This XC, this chest (figure 1), though fashionable and well executed is made of mixed indigenous woods. The sides are veneered in burr oak and crossbanded with elm whilst the moulded top is veneered in ash and similarly, banded in elm (figure 2). 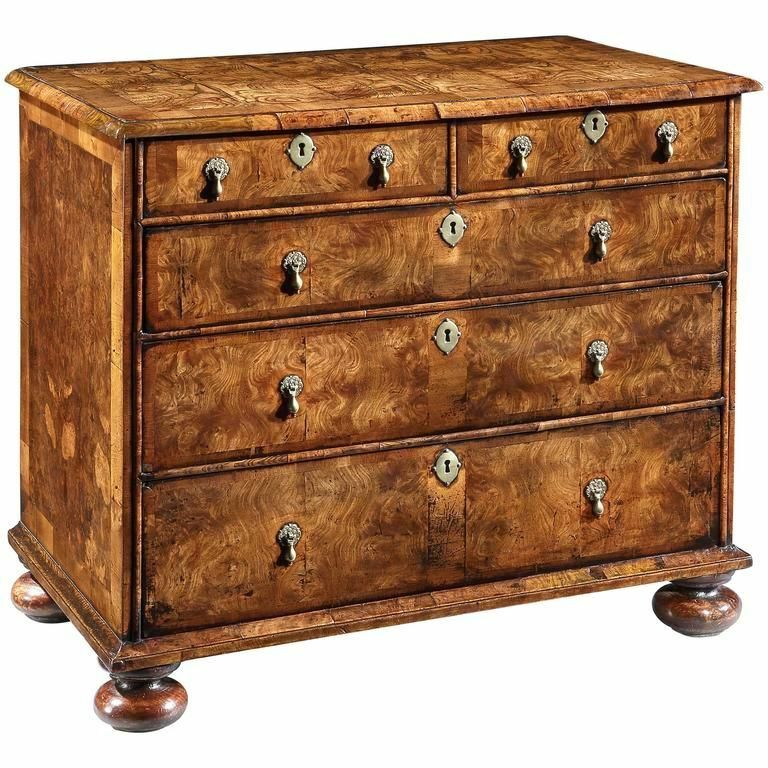 I don’t often despair of much (and it may just be because I’m in a fair bit of pain at the moment) however, the atrocities inflicted on, and written about this walnut chest of drawers give me little confidence in the continuance of humankind! That would be early eighteenth-century, George I (Charles II reigned from 1625-49). No! (twice) It’s circa 1715-20. Oh for crying out loud! They’re brass! What does “dual iron design” even mean? 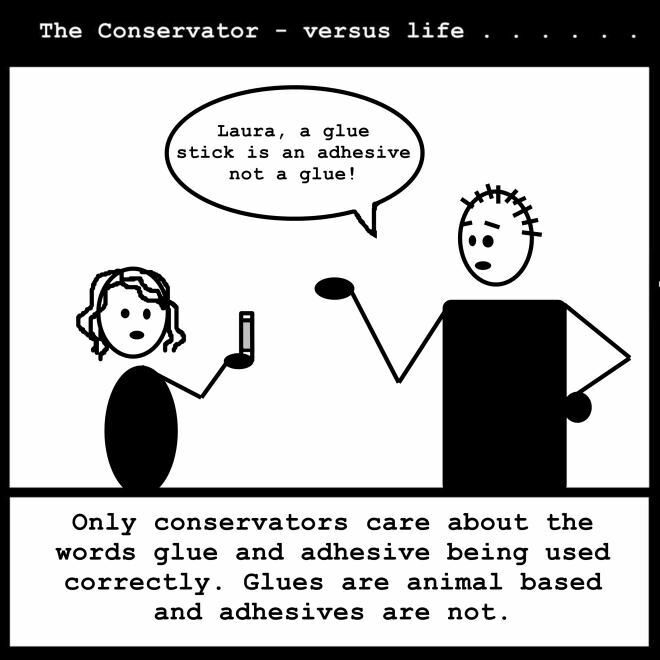 He can’t possibly mean escutcheons… can he? The moulding or the later bracket feet? Original finish? 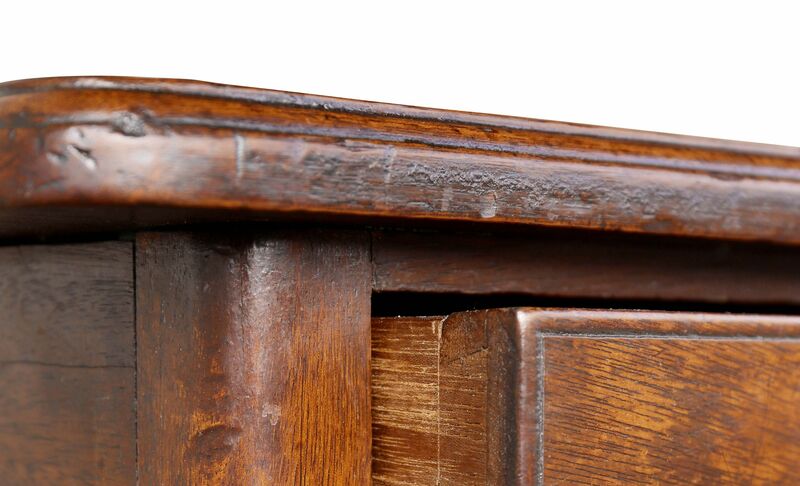 It’s since had a coat or two of “mid-tone” shellac slapped on it – inside and out (fig. 2)! Patina! It’s all been obliterated! Fig. 1. It never hurt anybody! Fig. 2. Was it a personal vendetta? Whilst having my weekly look around, this pretty little table caught my eye. 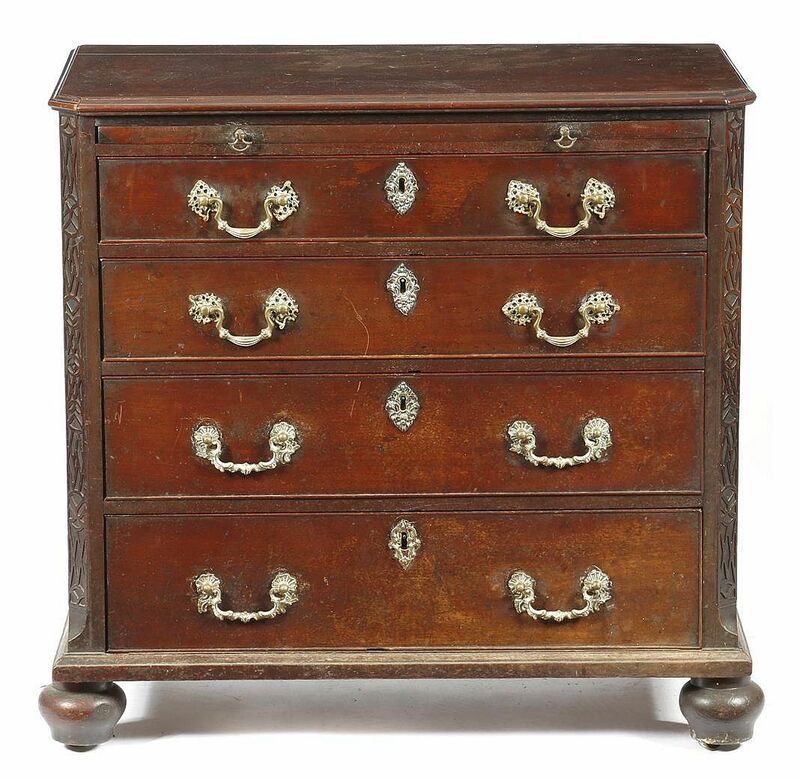 It’s described as George II, walnut, with original handles, circa 1750. Fig. 1. A nice quality table with lappets on its knees. Fig. 2. En suite handles and escutcheons. Fig. 3. Scratched ‘beading’ around drawer fronts. 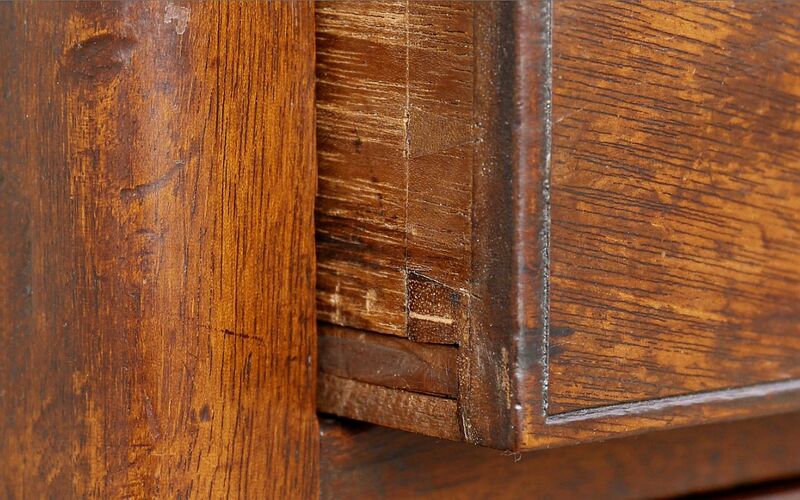 I have previously mentioned (here, here and here) how some early case furniture – for various reasons – gained bracket feet later in life. 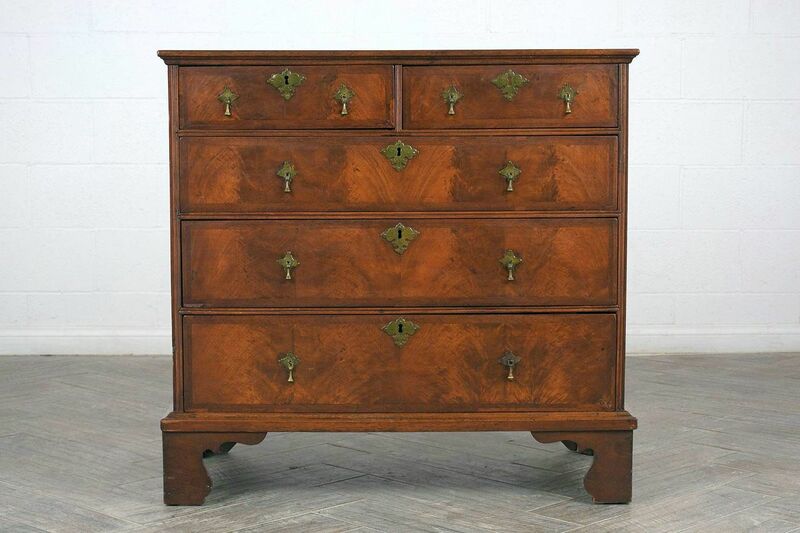 Conversely, upper chests from walnut chest-on-chests and less commonly, chest-on-stands, as late as 1750 occasionally gained/regained bun feet during the nineteenth- and twentieth-centuries to meet the demand for ‘nice original early chests’. Lot 193 at Woolley & Wallis’ Furniture, Works of Art and Clocks sale today, Wednesday the 3rd of October in their rooms in Salisbury, Wiltshire is one such Georgian mahogany chest that has lost its original bracket feet in favour of a set of bun feet. 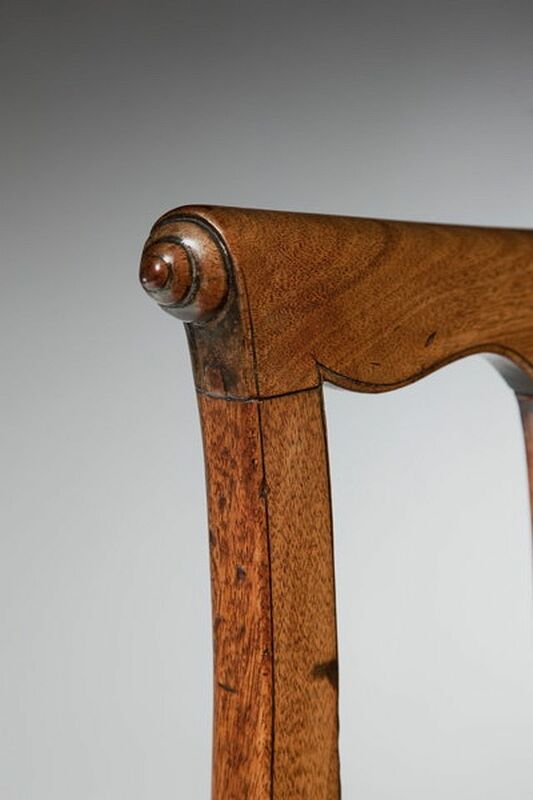 However, the later mahogany buns are not an attempt to evoke an earlier style, on the contrary; like the bracket feet that so often replace bun feet to update early walnut case furniture, these replacement feet (with concealed castors) are a subsequent Victorian modernisation. Before the introduction of mahogany, the walnut was “the cabinet-maker’s tree” in England, and it was well adapted for the purpose, — being tough and strong in proportion to its weight, beautifully variegated, admitting of a fine polish, durable, and obtained in sizes sufficiently large. 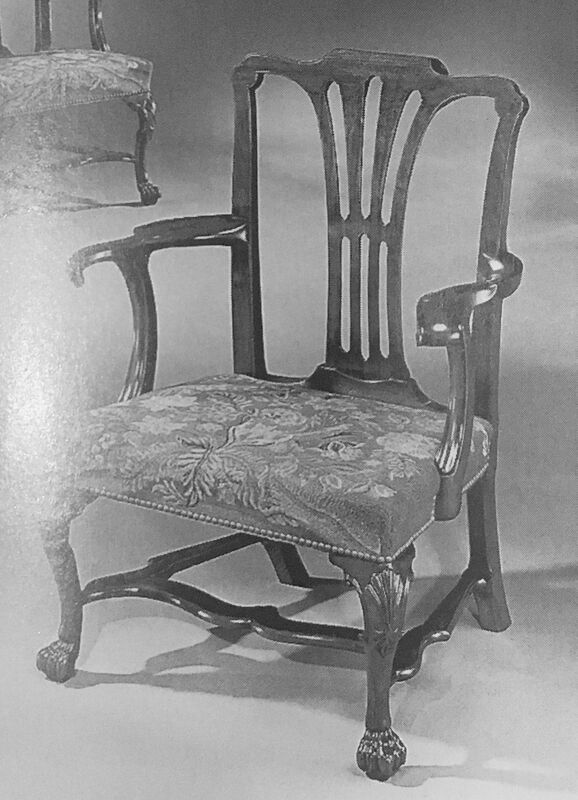 In many parts of the continent, where the expense of the carriage of mahogany is great, the walnut is still extensively used in the manufacture of furniture; and, perhaps, there is no native tree which bears the climate of England well, that is better adapted for the purpose. Oak, though abundantly durable, cannot be finely polished without great expense, and it is heavier in proportion to its strength. Of the Walnut-tree, (called by the Romans Juglans, or the nut of Jove,) there are very many species enumerated, which have been divided by modern botanists into three genera. Of these species it is necessary to mention only two as timber-trees, — the Common Walnut-tree (Juglans regia) and the White Walnut, or hickery-tree (Juglans alba). The first of these is a native of the warmer parts of Europe, or perhaps of Asia; and the last is a native of America. The common walnut is a very handsome and a very useful tree. It is true that the fruit does not come to maturity in the northern parts of this island; and that in the southern, nay in countries much farther south, it is apt to be injured by the frosts of spring. In many parts of this country it thrives well as a tree, and wherever it thrives it is variable. In England there are still a good many trees scattered over the country; but the number is not so great as it was formerly, the partiality for the woods of the colonies and other foreign countries having diminished the value of this, as well as of most other species of domestic timber used for finer purposes. There is still, however, one use to which the walnut-tree is applied, in preference to any other timber, and this use demands the qualities of beauty, durability, and strength: walnut-tree is employed for the stocks of all manner of fire-arms. Before it is used, however, it should be well seasoned, or even baked, as when recent it is very apt to shrink, a disadvantage which is completely got rid of by seasoning. The walnut grows rapidly till it attains a considerable size, which is even valuable as timber. The absolute duration of the tree has not been ascertained with accuracy; but, probably, the most profitable age for cutting it is the average of hard-wood trees, about fifty or sixty years. The demand for musket and pistol stocks during the late war thinned England of its walnut trees; and the deficiency should be made up by fresh planting. At that period the timber was so much in demand, that a fine tree has often been sold for several hundred pounds. Beside the value of its timber, the walnut-tree has many other uses. The ripe nuts are well known as a fruit; the green ones make an agreeable and wholesome pickle; and the oil is used for delicate colours in painting, and for smoothing and polishing wood work: sometimes, also, for frying meats, and for burning in lamps. The spring of 1827 was particularly destructive to the walnuts of the Bergstrasse, and the neighbouring parts of Germany, where the walnut is extensively cultivated for the oil. Many thousand trees were killed, and nearly all the branches of the rest were destroyed. When the leaves and recent husks, in their green state, are macerated in warm water, the extract, which is bitter and astringent, is used to destroy insects; and it is a very permanent dye, imparting to wool, hair, or the skin and nails of the living body, a dingy greenish yellow, which cannot be obliterated without a great deal of labour. On this latter account, it is said to have been used by gypsies, in staining the complexions of stolen children, that they may appear to be their own offspring. The quantity of oil in fresh walnuts is very considerable, being about equal to half the weight of the kernels. There are several varieties of the common walnut, — as the thick shelled, which afford the best timber; and the thin shelled, which have most fruit, and yield most oil. These, however, are mere varieties; for, as is the case with the oak, and many other trees, in which we find a variation in the colour and shape of the leaves, and in the fruit, all the varieties may be obtained by sowing the nuts of the same tree. A Description and History of Vegetable Substances, the Arts, Domestic Economy. Timber Trees: Fruits. Charles Knight, London, 1829, pp. 136-9. There are three species of mahogany: — Common mahogany (Swietenia mahagoni), Swietenia febrifuga, and Swietenia chloroxylon: the first being a native of the West India Islands and the central parts of America, and the second and third natives of the East Indies. They all grow to be trees of considerable magnitude — the first and second being among the largest trees known. They are all excellent timber. Swietenia mahagoni is, perhaps, the most majestic of trees; for though some rise to a greater height, this tree, like the oak and the cedar, impresses the spectator with the strongest feelings of its firmness and duration. In the rich valleys among the mountains of Cuba, and those that open upon the bay of Honduras, the mahogany expands to so giant a trunk, divides into so many massy arms, and throws the shade of its shining green leaves, spotted with tufts of pearly flowers, over so vast an extent of surface, that it is difficult to imagine a vegetable production combining in such a degree the qualities of elegance and strength, of beauty and sublimity. The precise period of its growth is not accurately known; but as, when large, it changes but little during the life of a man, the time of its arriving at maturity is probably not less than two hundred years. Some idea of its size, and also of its commercial value, may be formed from the fact that a single log, imported at Liverpool, weighed nearly seven tons; was, in the first instance, sold for 378/; resold for 525/; and would, had the dealers been certain of its quality, have been worth 1000/. 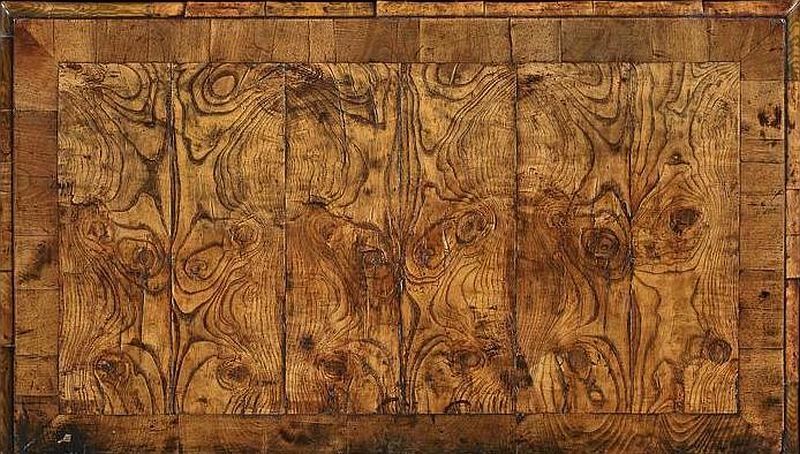 The discovery of this beautiful timber was accidental, and its introduction into notice was slow. The first mention of it is that it was used in the repair of some of Sir Walter Raleigh’s ships, at Trinidad, in 1597. Its finely-variegated tints were admired; but in that age the dream of El Dorado caused matters of more value to be neglected. The first that was brought to England was about the beginning of last century; a few planks having been sent to Dr. Gibbons, of London, by a brother who was a West India captain. The Doctor was erecting a house in King Street, Covent Garden, and gave the planks to the workmen, who rejected it as being too hard. The Doctor’s cabinet-maker, named Wollaston, was employed to make a candle-box of it, and as he was sawing up the plank he also complained of the hardness of the timber. But when the candle-box was finished, it out-shone in beauty all the Doctor’s other furniture, and became an object of curiosity and exhibition. The wood was then taken into favour: Dr. Gibbons had a bureau made of it, and the Duchess of Buckingham another; and the despised mahogany now became a prominent article of luxury, and at the same time raised the fortunes of the cabinet-maker by whom it had been at first so little regarded. A Description and History of Vegetable Substances, the Arts, Domestic Economy. Timber Trees: Fruits. Charles Knight, London, 1829, pp. 147-9. 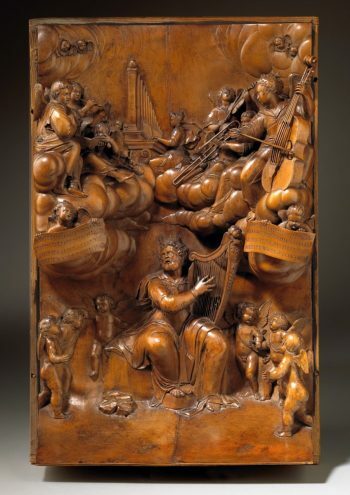 Grinling Gibbons, King David Panel, ca. 1670, boxwood (York: Fairfax House). Fairfax House is delighted to announce the recent acquisition of Grinling Gibbons’s King David Panel the earliest-known, surviving work by Gibbons—made in York. Saved from international export and potential obscurity in a private collection, this magnificent work now forms part of the permanent collection at Fairfax House. To celebrate the ‘home-coming’ of this exquisite piece of craftsmanship and to illuminate the extraordinary skill of Grinling Gibbons—the ‘Michelangelo of Wood’—Fairfax House will be mounting a major new exhibition in 2018, The Genius of Grinling Gibbons: From Journeyman to King’s Carver. Opening on the 370th anniversary of Grinling Gibbons’ birth, this exhibition also marks the 350th year of his arrival in York. Drawing on new research and bringing together artworks and sculpture by the hand of this iconic individual from across the country (including St Paul’s Cathedral, Hampton Court Palace, the Sir John Soane Museum, and the V&A), The Genius of Grinling Gibbons celebrates Grinling Gibbons’s unequalled talent, his visionary genius, and his ability to transform the medium of wood into something magical. It will explore his development from an obscure journeyman through to becoming the country’s most celebrated master-carver, working for the King himself.